As a family-owned and operated business, we enjoy giving back to the communities we serve. Thank goodness for our community projects lead player, Janet Brackenbury. Janet’s bubbly personality and superior party planning skills make her an ideal “Flack Artist”. 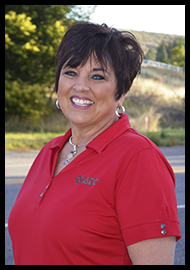 Janet has been with the company since 1985 and is spectacular at teaching 911 classes at our elementary schools, organizing our yearly Customer Appreciation Event, and everything in between. In her free time, she enjoys painting, cooking, working in her yard, and spending time with her fun-loving children and grandchildren. This vivacious, energetic people-person also loves riding horses, the classic Diet Pepsi and a good Ribeye Steak! We’re truly fortunate to have Janet as a member of our ATC team!